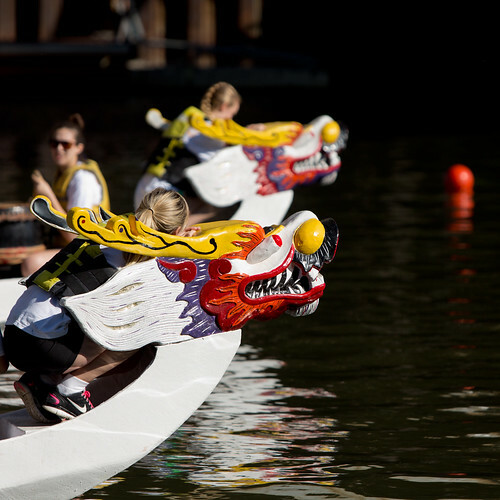 After a few years’ hiatus, Whirl and I returned to Chinatown today to get some photographs of the annual dragon boat competition. Whirl was also interested in checking in on the possible peregrine falcon nest site we spotted earlier this spring. It was a gorgeous day and we both had quite a bit of fun. The races have expanded significantly since the last time we were down to see them. I’ve posted the full set of race photographs. Also of interest is the faraway shot of Huff, the male peregrine falcon first sighted near the park in April and two photos of terns cruising the river.